Guys. Did I say Amazon??? Yes. Amazon. The Gilded Thimble will be closed until Tuesday to observe a family loss. Why not wear daddy's t-shirt loud and proud on your wedding day? We are used to sewing a heart inside of gowns to honor the loved ones who are no longer with us, but this bride wanted her daddy's heart to show on the outside of her gown. We obliged by beading the patch so that it took on the bridal look that her dress deserves. 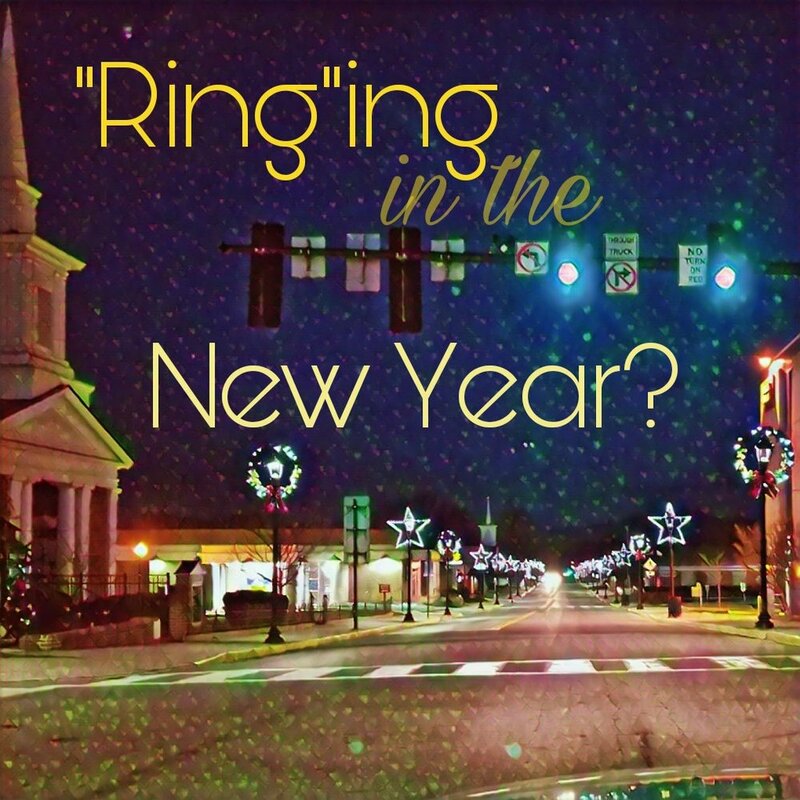 "Ring"ing in the New Year? 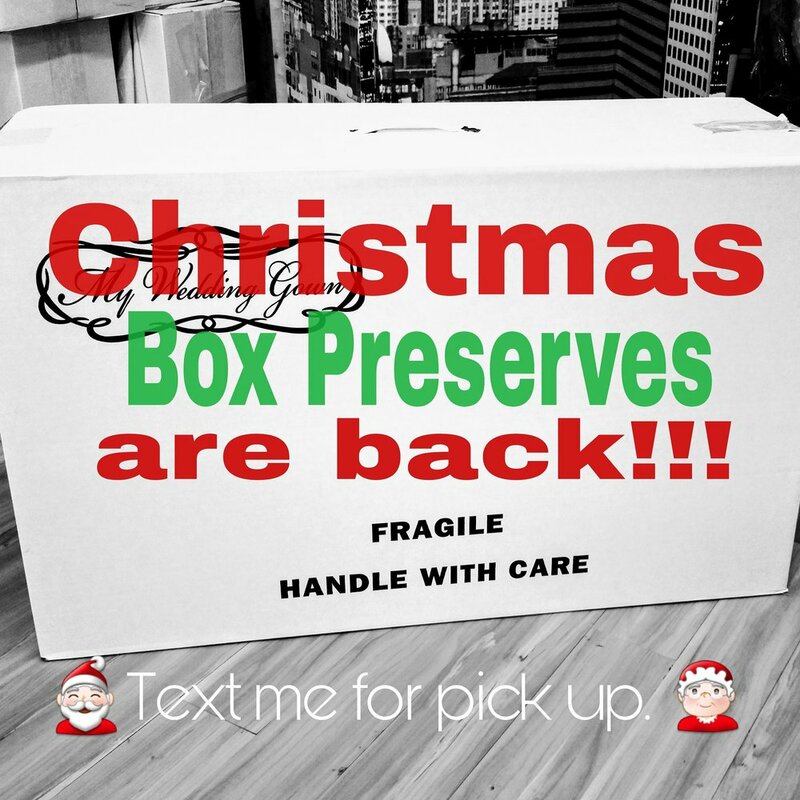 If you missed the deadline, we are still running our special of $25 off our box preservation package between now and 12/31/2017! New Bridal Gown with flaws? So, it's very common for us to see a gown having flaws eventhough it is straight from the manufacturer. B) Formulate a plan to fix it. C) Make it look better than new! This transformation focused on the fit of the gown and the redesign of the sleeves. Sooo beautiful!! Our couch is feeling all the reds this season. 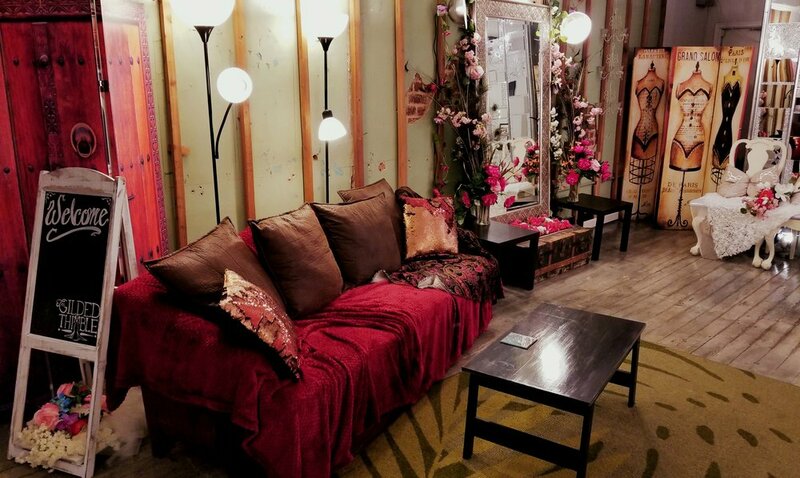 We have a cozy li'l seating area to rest your bones in while I sew. Wedding Gown Repair: torn tulle back gown. Sometimes sample gowns are ripped in the back by the clamps they use in the store. 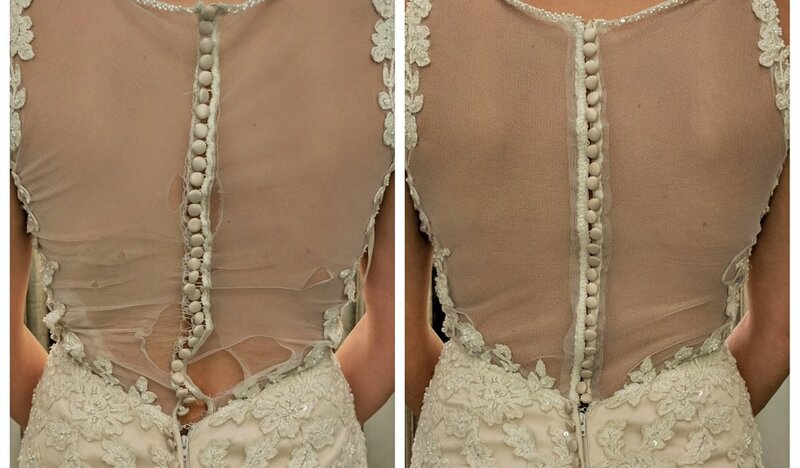 If you find a deal on a damaged gown, we can repair/ replace the back. Here's a grid showing the sequence of raising the neckline on this bridal gown. Box 1: Before pic. Bodice is too low for the bride's taste. She also wants a sweetheart neckline. Box 2: We made a sweetheart shaped overlay that included lining, shell fabric, and Chantilly lace overlay that matched the thickness and look of the gown bodice. We pinned it to the height she wanted. Box 3: We sewed the overlay to the gown. The bottom layers of the overlay gradually tapered to just lace, so with careful hand sewing, the line where one begins and the other ends is imperceptible. Box 4: We pressed the bodice with a tailor's ham to shape it and to work out the puckers. Our contact page is buzzin and poppin with appointment requests. Let's see yours next! Things are getting tight. The avalanche is real and it is coming! 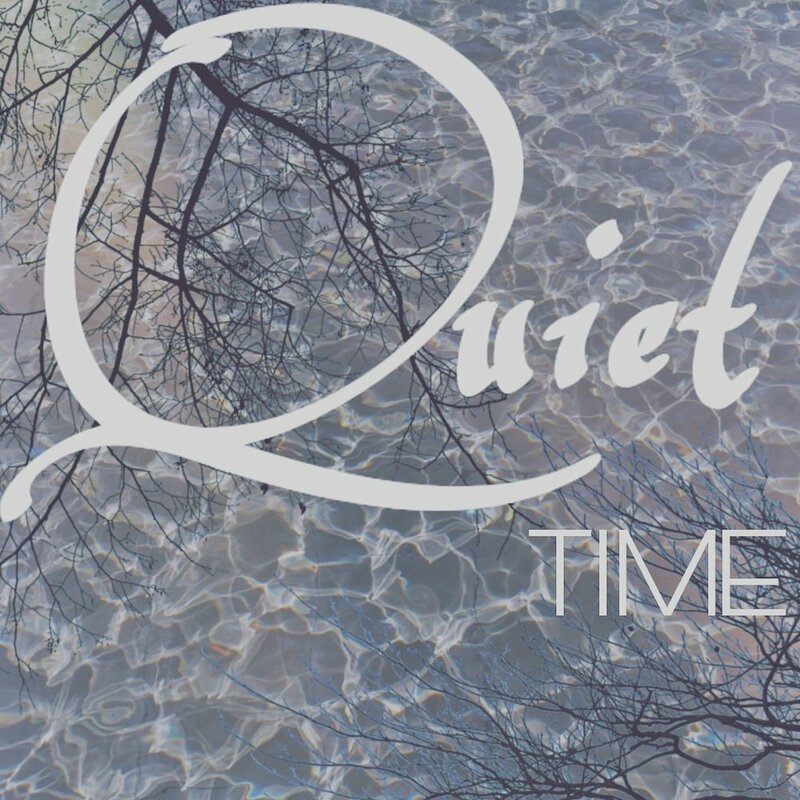 I wish you could see how many appointment requests just came in this past week. It is impossible to serve all of the brides that request. Book now, even if you don't have your dress in hand, yet. Tell your friends as well. We hate turning people away due to being booked.